Prominent & Leading Manufacturer from Surat, we offer hd brilliant premium engine oil (20w-40) and tc brilliant engine oil (15w-40). Pack Size 10 Ltr. , 20 Ltr. , 50 Ltr. & 210 Ltr. Grades Available Brilliant Premium Oil is high protection engine special oil for petrol diesel service developed for vehicles manufactured. This oil is red in color and blended from selected highly refined, high viscosity index base stocks and contain well-balanced group of extra additives, to provide high detergency, dispersity, and antioxidation characteristics to meet the stated performance standards. 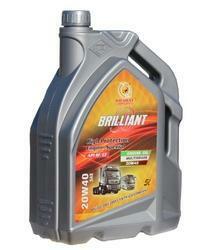 Application Brilliant Engine oil is recommended for all diesel vehicles manufactured. •Provide excellent resistance against wear and deposits in automotive supercharged diesel engines. •Have exceptional thermal and oxidation stability to resist decomposition in supercharged engines operating with high ring zone temperature. •Provide absolute control of corrosive wear that may result from the use of high sulfur fuels because of good built-in alkaline reserves. •Maintain a high order of engine cleanliness. Brilliant SAE 15W/40 is a premium quality mixed fleet engine oil recommended for use in all kinds of engines, both on and off-road and in a wide range of diesel engines. 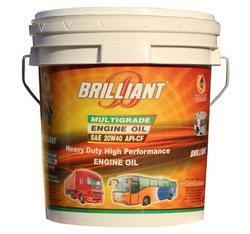 Brilliant 15W/40 has been designed to provide Premium soot dispersancy, exceptional cleanliness, and reduced oil consumption through the use of a unique combination of selected additives and base oils, and is suitable for use in normally aspirated and turbocharged diesel engines. Brilliant 15W/40 reduces maintenance and fleet operating costs. - Extended equipment life. - Ensures that the engine provides optimum performance at all times. - Controls bore polish and oil consumption. - Improved soot dispersancy will ensure a cleaner engine. - Increased engine durability. - Prevents deposits, especially in the piston ring grooves and on the lands - Continues to act efficiently for a longer time period than generally expected.